Himachal Pradesh Krishi Vishvavidyalaya (renamed as Chaudhary Sarwan Kumar Himachal Pradesh Krishi Vishvavidyalaya in June, 2001) was established on 1st November, 1978.The College of Agriculture (established in May, 1966) formed the nucleus of the new farm University. It is ICAR accredited and ISO 9001:2008 certified institution. Over the years, Palampur Agriculture University has contributed significantly in transforming the farm scenario of Himachal Pradesh. Today, the State has earned its name for hill agricultural diversification and the farming community has imposed its faith in the University. Academic Programmes: The University has four constituent colleges. The College of Agriculture has 13 departments, Dr.G.C.Negi College of Veterinary & Animal Science has 18 departments, the College of Home Science has five departments and the College of Basic Sciences has four departments. These colleges offer six Bachelor Degree programmes and the Dean, Post Graduate Studies offers 26 Masters Degree & 19 Doctoral Degree programmes. Research Activities: The Directorate of Research coordinates research in the field of agriculture, veterinary and animal sciences, home science and basic sciences. 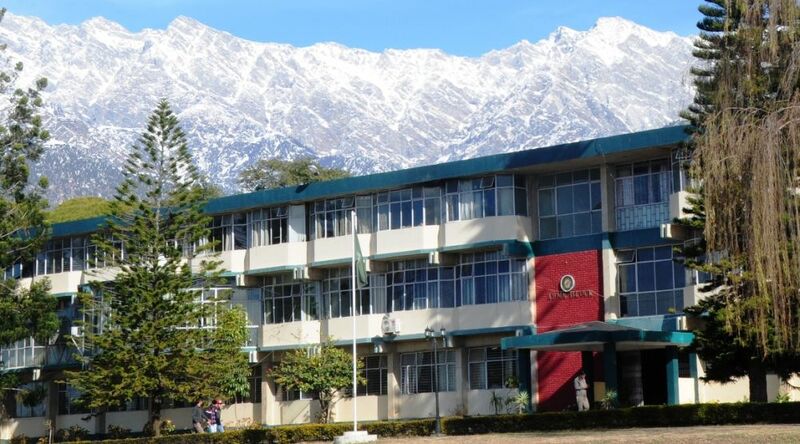 It has been giving priority to the location specific, need based and problem oriented research with multidisciplinary approach at main campus Palampur, 3 Regional Research Stations (Bajaura, Dhaulakuan & Kukumseri) and 10 Research Sub-stations (Kangra, Malan, Nagrota, Salooni, Akrot, Berthin Sundernagar, Sangla, Leo & Lari) situated in all districts of the State (except Solan and Shimla). The University has developed need-based technology for the different regions of the State and has released 147 improved varieties of different crops (Wheat 22, Paddy 23, Maize 9, Barley 5, Pulses 23, Vegetables 25, Oilseeds 22, Buckwheat 2, Sugarcane 1, Soybean 1 Fodder 12 and Tea 2). Around 800 quintal breeder seed of different crop varieties is produced and supplied to the State Department of Agriculture for further multiplication and making it available among the farming community, every year. The University has released 13 improved agricultural tools to reduce drudgery in farming. Over 100 farm technologies have been recommended to the farmers. Three patents have been granted to the University by the Patent Office, Govt. of India. Successful research work has been done on natural resources management, animal diseases control, animal breeding, etc. and perfect technologies have been developed for different regions of the State to enhance crop and animal production. Extension Education: The Directorate of Extension Education shares the responsibility for planning, implementation and coordination of various extension education programmes of all the departments of four constituent colleges and research stations in close collaboration with the State Departments of Agriculture, Animal Husbandry, Fisheries and other concerned departments and institutions. It conducts a large number of trainings for farmers, livestock keepers, farm ladies, rural youth, etc. at main campus and at its eight Krishi Vigyan Kendras (Farm Science Centres) at Bajaura, Dhaulakuan, Hamirpur, Una, Mandi, Kangra, Berthin and Kukumseri. The Agricultural Technology Information Center is serving as a single window service to the farmers. Media Cell projects and protects the image of the University among target clients and others by various Public Relations and Communication tools.